The South Korean public is questioning the validity of three separate investigations into the April ferry disaster, close to four months after the maritime accident. The investigations have led to arrests and indictments. But the efforts have also raised fresh allegations that require, critics of the government say, further examination. Prosecutors and police launched the first official probe into the ferry accident on April 18, only two days after the Sewol ferry had sunk in waters off the coast of southwestern Korea and left hundreds dead. Lawmakers initiated an additional investigation in late May. 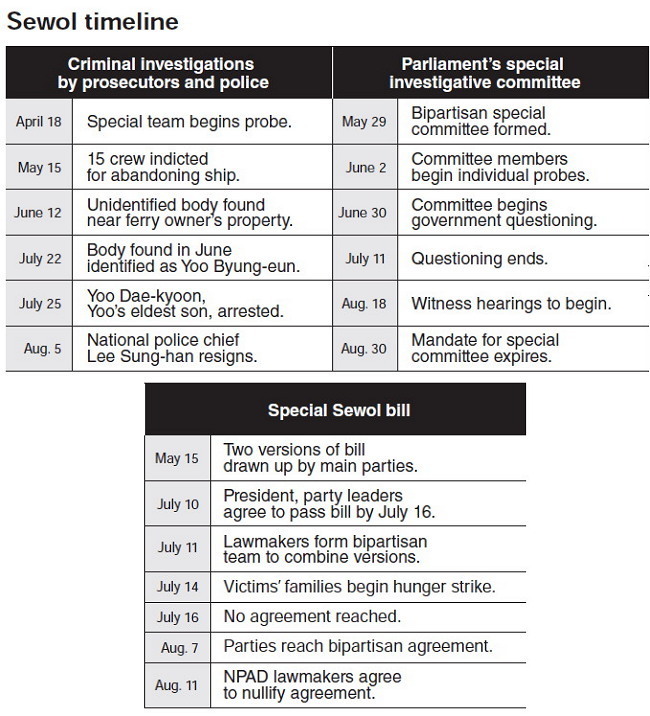 As of Tuesday, another parliamentary investigation is set to begin once a controversial bill ― dubbed the “special Sewol bill” ― is legislated. Families of the victims have been the most impassioned critics of the probes. They are camped in front of the National Assembly building and also at Gwanghwamun Square in downtown Seoul to voice their discontent. Many of them have also been carrying out a hunger strike since mid-July. Criminal investigations by law enforcement have led to the arrest of more than 130 people, officials have said. On May 15, the crew members of the ill-fated ferry were indicted for abandoning hundreds of passengers on the ship immediately after the accident and are undergoing trials. Prosecutors have also indicted shipping industry officials for chronically violating safety regulations. Public officials have also been arrested for allegedly receiving kickbacks from the private sector in return for condoning the violations. Yoo Byung-eun has been the symbolic highlight of the criminal investigations. Yoo is the owner of Chonghaejin Marine Co., the shipper that operated the Sewol. Yoo and members of his family were charged with embezzling company funds which should have been used to enhance safety standards on the ship. Yoo led police and prosecutors on the nation’s largest-ever manhunt for weeks. In late July the hunt came to an abrupt, embarrassing end. An unidentified body that later turned out to be that of Yoo Byung-eun was found in June near the vacation home of the wanted man. Authorities only identified the body on July 22, sparking accusations of serious delinquencies among law enforcement officials. Korea National Police Agency chief Lee Sung-han resigned on Aug. 5 while a police spokesperson said investigations had been “imperfect.” Related investigations are still ongoing. Lawmakers meanwhile in late May formed a special committee to investigate the government’s botched rescue operations on April 16. The committee set out to examine allegations that senior government officials had made critical mistakes during the rescue operations, contributing to the disaster. The allegations even include those against President Park Geun-hye, whose whereabouts on the day of the accident remain unclear. Opposition lawmakers say the government’s chief executive should have taken firm control of the rescue ops. But fierce political tension among lawmakers has fettered the panel. During one government hearing session on July 2, Rep. Cho Won-jin of the ruling Saenuri Party led a temporary boycott of the investigation after opposition Rep. Kim Kwang-jin made a controversial remark about President Park. 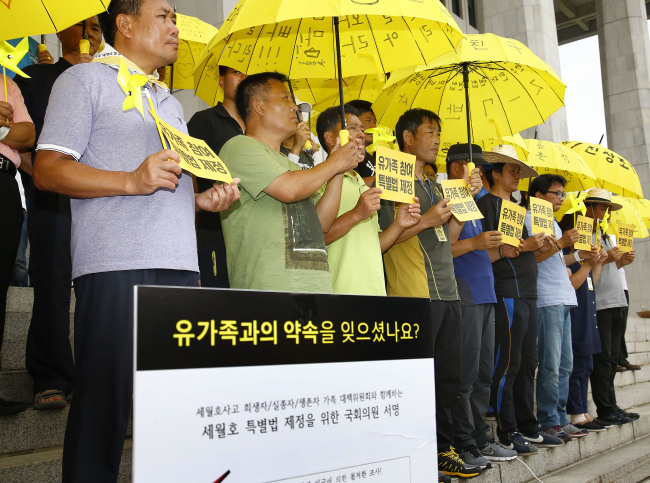 In yet another attempt to investigate the accident, lawmakers created a bipartisan task force to write the so-called “special Sewol bill” on July 11. The bill would create an inquiry panel for determining the causes of the accident. Public reaction was mixed. Critics said the inquiry panel would be redundant. After all, they said, it would be the third of its kind ― a temporary committee investigating the April ferry disaster. Supporters of the bill said the panel was necessary since the two earlier investigations by prosecutors and lawmakers had produced little meaningful results. As of Tuesday however leaders of the main opposition New Politics Alliance for Democracy and Saenuri Party were still at loggerheads over the special bill. The partisan friction centers on whether to give the inquiry panel prosecutorial powers ― special legal authority usually only given to prosecutors such as the right to ask judges for search warrants. Opposition lawmakers and the victims’ families say the panel must be given such powers to guarantee a genuine investigation, which will have to investigate the highest of officials including the president. Saenuri lawmakers are against the idea. Prosecutorial powers must be given only to those who are trained to wield such authority, they say. Public patience is winding down. A Gallup Korea poll conducted in late July reported 64 percent of those surveyed believed that the causes of the accident have yet to be completely uncovered. About 66 percent said they didn’t trust the recent investigations. Approximately 53 percent said an inquiry panel created by the special Sewol bill should be given prosecutorial powers. After the April 16, 2014 Sewol ferry tragedy, the media published a flood of indiscriminate articles regarding the EBC (also known as Guwonpa* in Korean)and Mr. Yoo Byung-eun. Due to the immense volume of articles, it is impossible to correct and counter every single one. Therefore, in agreement with the EBC and the surviving family of Mr. Yoo Byung-eun, we are publishing the following combined corrections and Official Statement by EBC.